Hi everybody!! I just finished rush at my college, and I'm so happy to announce that I am a Delta Delta Delta!! Woohoo!! I posted my outfits each day on Instagram stories during rush, but I wanted to share with you all what I wore during recruitment and give you some ideas for rush outfits for those of you who rush during the spring. I know I rush at a different time than most of y'all, but I do know that a lot of small private schools like mine rush PNM's in the spring semester. This might give those of you with delayed rush some insight on how to look cute and stylish for recruitment in cold temps! I'm super excited to share my rush experience with you all, so look for that on the blog in the next few weeks!! An important thing to note here is that these outfits are specific to my school. While many sorority rush outfits are universal for some schools, other schools have very specific requirements (and also different rounds). Keep those things in mind. The best thing to do is check with your school's Panhellenic group before picking out your outfits. Your Pi Chi (Rho Gamma, Gamma Chi, etc.) can also be a resource for outfit guidelines. Open House and Philanthropy round are combined at my college because we only have 7 sororities. My college gave out recruitment T-shirts, which every PNM had to wear. Since every other PNM is wearing the same shirt, I wanted to wear these tassel earrings to stand out a bit. I'm so glad I did! I got so many compliments on them and I think that helped me to distinguish myself among others. Today was super casual, so I paired the top with cuffed jeans and converse. We rush in the winter, so shorts/skirts were just not an option in 20 degree weather. I also were converse because you want your feet to be as comfortable as possible, as this round is the one where you will be standing the most. Sisterhood Round is described as "church clothes" at school. So basically dressy clothes that you would wear to dressier events, but not a cocktail dress. I chose to wear warm clothing today since I knew I would be walking quite a bit. I wore this ruffled sweater, checked skirts, tights, and boots. So many girls complimented my outfit. When you make yourself stand out in rounds with your clothing, it helps to make a face to a name. The outfits aren't everything, but they can definitely be a conversation piece and a way for a girl to remember you. I am so thankful I wore boots because these were so comfortable. The rounds were 45 minutes (longer than yesterday's which were 35 min), so I was standing much longer. Preference Tea is the dressiest day out of all of recruitment. At this event a cocktail dress (or jumpsuit) and heels are almost always required. I chose this classic shaped red dress because red is such a statement color. I also wore a pair of heels that I've worn to several events before, so I knew they would be comfortable during this round. During Pref Tea you usually sit in chairs, so don't worry if your heels are uncomfortable. This round is the most "relaxing" in my opinion because you are sitting down and should at this point feel comfortable with the women you are talking with. How do you keep warm in this outfit you might ask?? Every single Pi Chi and PNM were wearing some form of UGG boots or moccasins, joggers or sweatpants, and coats. It was so funny seeing each girl's dresses layered over there pants! The first and third outfit is no where near "warm", so I thought I would share some insight to keep warm on those days. For the rounds where your school requires you to wear a specific shirt, layer up! I chose not to layer because I knew I would get hot in the parties, but many girls wore scarfs, cardigans, and jackets. It's totally up to you! I wore a coat and jacket over my shirt while I was walking to the different sororities, so I was warm everywhere else. For Pref Tea and the dressier rounds, you are going to be cold- it's just a fact! I suggest bringing UGG boots or moccasins to change into so you don't have to walk in heels all over campus. I also layered my joggers (many girls chose sweatpants/leggings/etc). And of course a coat is necessary. 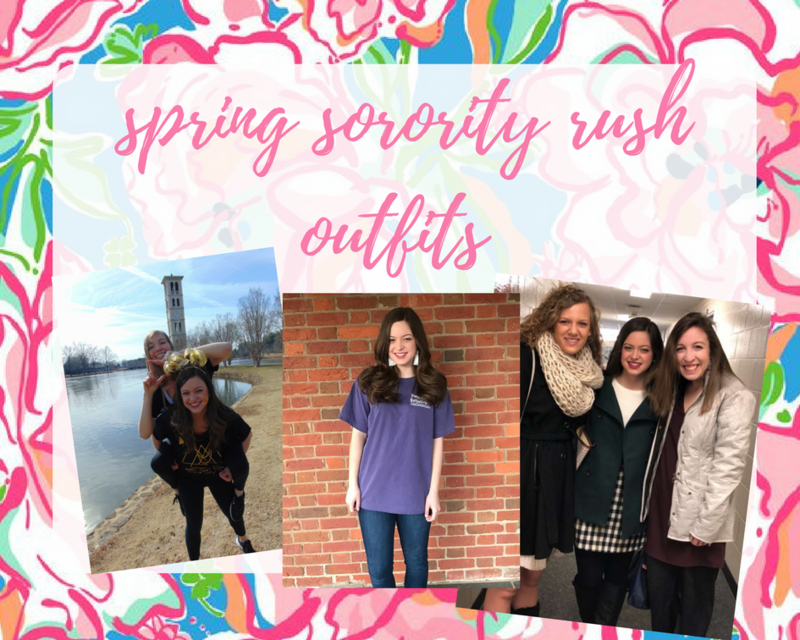 I hope you all found this post to be helpful in picking out outfits for Spring rush! If you have any questions or would like to know if your outfit is rush appropriate, please reach out to me! Thank you for reading!